At top left is a rare cigar cutter made by Remington. Unfortunately both blades are broken. Second on right is a Swedish Snuff box made by C. A. Erickson & Sons. Second on left was made by Clinton Cutlery and is engraved CHARLES C. CHASE, SEPT. 18, 1889. It has a match striker plate. The bottle shape corkscrew was made by M. Hunter & Son of Sheffield, England and includes a pipe pricker. 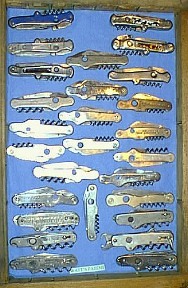 There are several Sterling tools with cigar cutters, cigar box nail removers, cap lifters, wire cutters and corkscrews. Only one has a maker's name: Schulder, Germany. The peg & worm corkscrews have Pipe Tampers. The one on the left is marked STEWARTS' DUNDEE, CREAM OF THE BARLEY SCOTCH. Below the PAL is a Graef & Schmidt knife with match striker blade and cigar box nail remover. The white corkscrew matchbook is from the Corkscrew restaurants of Alberta, British Columbia and Ontario, Canada. The German sword is marked D B P 887711 and has a bayonet fit sheath. 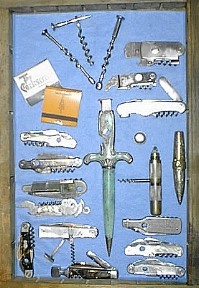 The Cigar shape at mid right unthreads in the middle, a corkscrew slides at an angle to the case and the case is screwed back together to form the handle (A roundlet). It has a Bulldog on it. Left of the Bulldog is a roundlet with lighter. Inside are a corkscrew, screwdriver, awl and leather punch. All fit into a slot in the tool. The five to the left of the sword: An elegant knife made by Paul's Bros. Cutlery. A knife by H. Kerschner, Solingen (Germany) with advertising for Wolf's Monogram Whiskey, Kansas City, Mo. A knife with Ashtray and Matchholder. A multi-tool engraved C.W.C. and a pipe tamper that pushes the corkscrew up made by C. W. Engels, Solingen. Upright at lower left is a Tortoise scale knife by Krusius Bros., Germany. Above the Vom Cleff is a celluloid handle knife by Union Cutlery Co., Olean, New York and a Griffon Cutlery Works, Germany knife with advertising for Lembeck & Betz Eagle Brewing Co., Jersey City, N.J., American Club Beer. 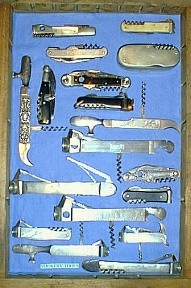 The three at the top left and three at the top right have glass cutter blades in addition to knife blades, corkscrews and cigar cutters. By Dolphin Cutlery, New York (made in Germany) advertising for Nann & Kress, 117 S. Salina St., Syracuse, N.Y.
Another by Dolphin engraved John Jahr, 126 W. Clark St., Albert Lea, Minn.
Made by Kamp Cutlery Co., Germany. Dolphin Cutlery Co., New York / Germany. Advertising for Lembeck & Betz Eagle Brewery, Jersey City, New Jersey. Lafayette Cutlery Co., Germany. No Advertising. Indianapolis Brewery Co. on scales as well as blade tangs. Unknown logo on this one. Superior quality knife engraved on obverse "R. C. Blackall" and on reverse "Made by Joseph J. Walton, N.Y.
Made by John Watts, Sheffield. Marked WATT'S PATENT. Advertising for Heidsieck & Co., Dry Monopol. Marked MESSER KÖNIG. A German copy of the Watt's Patent? Another Watts knife. This one has a lot of markings on the scales including: CIGAR CUTTER, WIRE CUTTER and MADE IN SHEFFIELD, ENGLAND. Master blade tang marked D PERES, GERMANY. Advertising Powell Valves. Made by H. Keschner, German. Advertising Hauck's Red Monogram Beer. Majestic Cutlery Co., Germany advertising Mathie's Beer, Costs no more but tastes like more. Another Watt's Patent engraved "Brodrick & Peters, Hull." Also stamped on the handle is PLA TIN OID. Another Watt's with the PLA TIN OID mark. Also has glove or button hook and 3" rule marked on scale. Another like bottom left knife.